In a dark moment of irony, the first thing I saw when I booted up my iPhone on the way out of the cancer film “50/50” was the news of Apple founder Steve Jobs’ passing. As this is not an entertainment blog, I don’t feel it’s my place to dedicate a full article to the man, but news of his death certainly saddened me, and this is as good a space as any for a hearty “Rest-in-Peace.” I use my MacBook Pro to write and publish everything you see on this site; I don’t go anywhere without my iPhone, and I love my iPad to death. These are only some of Jobs’ contributions to the world. He truly was a visionary, and through his innovative approach to our interactions with technology, he changed the world forever, and for the better. I myself am an Apple convert for life. Jobs will be missed. For the first two-thirds of Jonathan Levine’s “50/50,” I found myself respecting the film more than actively enjoying it. Writer Will Reiser based the film off his real-life experiences as a young cancer survivor, and that lends the project an incredible sense of honesty. 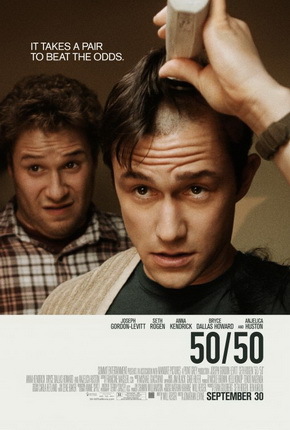 Where most cancer films are disingenuous and tacky, “50/50” is down-to-earth and earnest. The effort is impressive, and I certainly admired how the cast tackled the material just as sincerely as the script. Yet much of the film left me cold; I wasn’t responding to much of the humor, I felt ambivalent about several of the major emotional beats and relationships, and the tone seemed a bit too low-key for its own good. Then something incredible happens: “50/50” stages one of the more incredible third act turnarounds I’ve seen in a long time. In fact, calling it a ‘turnaround’ is a mistake, because all the pieces that make the final half-hour great were already in place from moment one. The character arcs and relationships all pay-off in spectacular fashion, delivering an emotional pummeling so powerful and raw that in the hours since seeing the film, I’ve been in a sort of reflective trance. I do have legitimate complaints about the first hour, but the emotional content of the last act feels organic only because the earlier portions of the film take their time establishing these characters. One hour in, I was ready to dismiss “50/50” as a forgettable, if admirably crafted, B– level comedy. Thirty minutes later, the film had put a giant, warm smile of catharsis on my face and elevated itself to a well-earned B+. That’s a fairly terrific feat, and if “50/50” isn’t perfect, it’s still a must-see. The plot is simple, as this sort of story should be: Adam (Joseph Gordon-Levitt) is a young man who works for a radio station. After experiencing back-pain, he visits the Doctor and learns that he has a rare type of cancer, requiring chemotherapy and possibly surgery. The rest of the film charts his progress, as his friend Kyle (Seth Rogen), girlfriend Rachael (Bryce Dallas Howard), and therapist Katie (Anna Kendrick) help him along. This is not your typical “cancer-comedy.” It doesn’t fall back on the genre crutch of characters discovering themselves thanks to a sudden illness; it’s not about zany plot twists or unexpected occurrences. “50/50” instead focuses on the subtle ways cancer changes the lives of both the patient and their friends and family, how gradually but radically our circumstances change when faced with our own mortality. I’ve been around people with cancer several times during my life. One of my earliest memories is my Mother helping my Grandmother cut off the rest of her hair after chemotherapy, and since then, I’ve also watched my Father and an Uncle struggle with the disease, among others. As such, I’m particularly sensitive about the portrayal of cancer in films, but also very receptive to cancer stories done right, and nearly every element of “50/50” rings true, none more so than Joseph Gordon Levitt’s performance as Adam. Levitt is extremely reserved in the role, burying emotions and expressions deep down and rarely letting them up for air. He appears cool, calm, and more or less collected at all times, and on the surface, it may look like a laconic bit of acting. On the contrary. Having known so many people with cancer, words can’t quite explain how perfectly he captures the disease’s emotional toll. Levitt is almost frustratingly calm at times, as are many cancer patients. Be it a coping method or a genuine zen attitude, I’ve never known a cancer patient prone to fits of emotional award-baiting speeches – the typical portrayal of cancer in many films – and if Levitt seems overly calm, that’s only a reflection of reality. Those with cancer do open up or find themselves overwhelmed eventually, though, and the moment where Levitt shows us what Adam is really feeling is absolutely haunting, one of the best bits of acting I’ve seen all year. The supporting cast strives for the same level of earnestness. Seth Rogen is basically playing himself, because he and writer Will Reiser are good friends in real life and thus experienced this scenario together. Rogen provides most of the film’s laughs, and if you’ve ever seen a Rogen performance before, you know what to expect here. But Rogen is one of the best at what he does not just because he can produce chuckles, but because those jokes come from a place of honesty and warmth, a talent he exemplifies here. He can be crude and juvenile and selfish, but his love for his friend is never really in doubt, and I absolutely love where Reiser and Rogen take the character in the last act. Reiser explores the effect cancer has on romantic relationships through Bryce Dallas Howard’s character, Adam’s girlfriend. Her struggle to support Adam in his time of need doesn’t feel cartoony, as it easily could, but rather an authentic exploration of how some people are simply incapable of the selflessness it takes to guide a significant other through cancer. Reiser condemns the character a tad too much in the end for this story to really hit home – in a film that revels in subtlety, Reiser expresses his opinion on this woman with the nuance of a sledgehammer – but Howard is very good in the part, and overall, I think the sub-plot is a valuable part of the narrative. More impressive is the relationship between Adam and his therapist Katie, played by Anna Kendrick. Kendrick has been one of my favorite actresses since she stole the show away from George Clooney in “Up in the Air,” and here she is cast in a part very different from her prior roles. Katie isn’t confident, quick-witted, or headstrong, but nervous and unsure of her abilities. The character and Kendrick’s performance are both so rich and thoughtful that one could easily center a film around this young doctor’s struggles to connect with doomed patients. Instead, Katie is just one part of “50/50”’s grand tapestry, and the film is deeper and more significant thanks to Kendrick’s presence. She and Levitt have tremendous chemistry, and though their story would undoubtedly feel trite under less skilled hands, Reiser gradually develops their relationship along an organic and engaging path. Adam also has to deal with his parents, of course; his mother, Anjelica Huston, is overbearing, and his father suffers from Alzheimer’s. The Alzheimer’s angle is poorly integrated and woefully under-developed, the only part of the film that absolutely rings hollow, and the scenes between Adam and his mother don’t connect until near the end of the film. But when those scenes do start to work, they work beautifully, and one of my favorite moments in the film is an emotionally charged, non-verbal exchange between Levitt and Huston. I’ve focused on the emotional, serious side of the film so far because this material left the greatest impression on me, but “50/50” is, technically speaking, a comedy. It is not a comedy because the filmmakers find cancer whimsical, but because a proper cancer story requires a reflection of life’s dichotomy between light and dark moments. Cancer doesn’t erase all humor and joy from the world, just as good health doesn’t fill our lives with sunshine and roses. “50/50” is a comedy because Reiser knows this fact first hand, and his script deftly modulates between humor and serious emotion, mirroring how life operates even in the midst of cancer. At its best, “50/50” can be brazenly funny and heartbreaking in the same moment. Not all the jokes connect, but I feel this is more a matter of taste; I may not have enjoyed all the humor, but that’s not the important part. What matters is that the film can mix laughs and pathos together organically, and reflect real life in the process. It does so wonderfully, and though the film is imperfect, anybody who has ever had a loved one with cancer – or cancer survivors themselves, I suspect – will find it to be an emotional, cathartic experience. I HAVE READ MR LACK'S REVIEWS SINCE HE FIRST BEGAN SUBMITTING THEM TO "THE HUB" SECTION OF THE DENVER POST. HIS PROGRESS IN THE QUALITY OF THE MOVIE REVIEWS IS SIGNIFICANT OVER THE YEARS. NOW THAT HE IS IN UNIVERSITY THEY HAVE IMPROVED EVEN MORE. HIS REVIEW OF "MONEYBALL" IS AMONG HIS FINEST! HE IS STARTING TO COMPARE FAVORABLY WITH GENE EBERT AT HIS BEST IN THE 1980S AND 90S. HOPEFULLY, MR. LACK WILL CONTINUE, AND EVENTUALLY BE PICKED AS THE PRIME MOVIE CRITIC FOR A MAJOR MEDIA OUTLET.